Kathy is an energetic design leader who is always looking for new ways to inspire visionary thinking and cross-collaboration across teams and partners. She currently leads user experience for Charles Schwab’s Austin Digital Accelerators and Advisor Services. 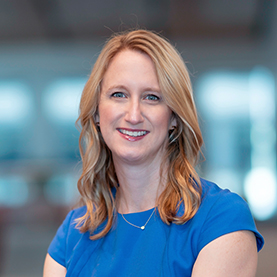 Prior to joining Schwab, she led a multidisciplinary UX team for Dell Services IT, focusing on the end-to-end service experience for Dell customers from support through the support agent experience. While at Dell, Kathy helped to lead the transformation of Dell Support to a responsive design, serving over 4 million customers per week and introduced user experience into the agent desktop experience on Salesforce. Kathy has worked on a range of projects and clients throughout her career spanning across a wide variety of brands including BMW, Southwest Airlines, Samsung, and State Farm. Kathy lives in Austin, Texas with her husband and family and holds a bachelor’s in Communication with a minor in Psychology from the University of Texas Permian Basin. Check out the incredible speaker line-up to see who will be joining Kathy.